Vietnam is ready for hosting the Asia-Pacific Economic Cooperation (APEC) meetings in the country’s central city of Da Nang in 2017, Deputy Prime Minister and Foreign Minister Pham Binh Minh confirmed at the 28th APEC Ministerial Meeting (AMM) in Peru on November 18. Addressing the meeting’s session on preparations for the 2017 APEC Year in Vietnam, Deputy PM Minh said Vietnam proposes the theme of the year as “Creating new driving force for a common future” based on the APEC’s common need of new momentum to promote integration and connectivity in the new context and maintain peace, stability, development and prosperity in the region. Around 200 activities, including eight ministerial-level conferences, will be held across Vietnamese cities and provinces, while the 25th APEC Summit will take place in Da Nang, he revealed. Ministers extolled Vietnam for her careful preparation and welcomed the theme of the event. They expressed their belief that the APEC Year 2017 will contribute to widening and deepening regional collaboration and connectivity. 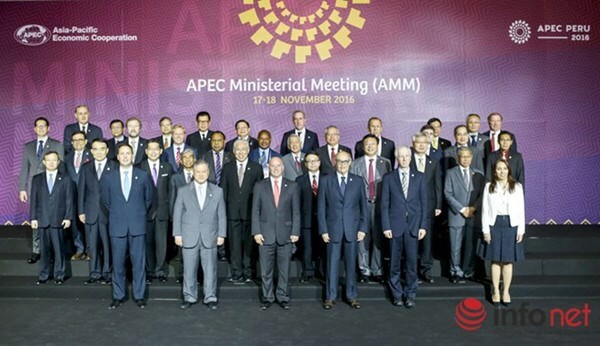 Another focus of the 28th AMM was human development – one of the top priorities of APEC cooperation. The participants emphasized the importance of education, innovation, vocational skills training, corporate culture, and information technology to human resources development in the digital era. They held that it is necessary to improve the quality of and increase the access to education services, while ensuring job generation and quality life for all, especially women, youngsters and people with disabilities. They welcomed the Joint Statement adopted at the sixth APEC Education Ministerial Meeting (AEMM) in Peru in October and agreed to further enhance education cooperation to develop high-quality human resources. As APEC observers, representatives from the Association of Southeast Asian Nations (ASEAN), the Pacific Economic Cooperation Council (PECC), and the Pacific Islands Forum (PIF) proposed developing cooperation for sustainable growth and jointly building a post-2020 vision for APEC. Deputy PM and FM Pham Binh Minh said digital technology is a push for fundamental changes of economic sectors and it is expected to spur the global economy. APEC should step up collaboration in education and digital connectivity, particularly in rural and remote areas to reduce poverty and empower women and girls. He stressed that developing human resources is one of the priority measures of Vietnam to realise its socio-economic development strategy through 2020. The same day, the 28th AMM concluded with the passing of a Joint Statement on measures to boost APEC cooperation, which will be submitted to the 24th APEC Summit on November 19-20.